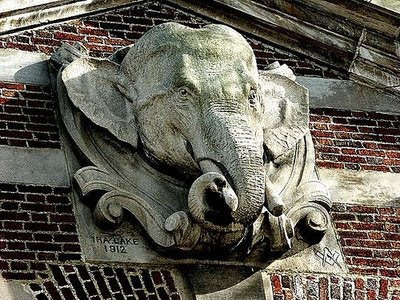 The news from the elephant house, pictured above, is bad. We have lost Buki. She was our oldest elephant. She was 52.
Who does not love those elephants? The zoo's press release is enough to break your heart. Everyone has an elephant story. Howard and I have one that we love. Once we were walking through the zoo and one of the elephants looked at us slyly. And then it dived into a pond. For a minute it was entirely under the surface. We could not see it. And then it stuck up its foot! Out of the water. For us to see. Just like a little kid! Then that big elephant head came back up out of the water and the elephant sort of winked at us. As if to say, "Did you see that?" I wonder if that was Buki. Regrettably I do not know one elephant reliably from another. I am not that regular a visitor to the zoo because my life is a zoo all on its own. But Buki was a circus elephant and that sounds like something she might have done. I understand Buki was pretty old for an elephant. She came to this country in 1958 when she was a baby. 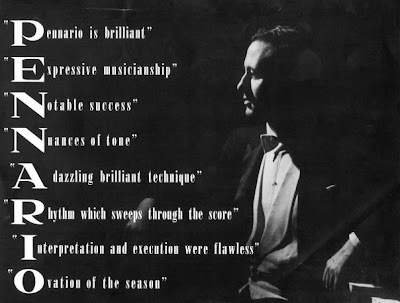 That was the year Leonard Pennario sold out London's Royal Festival Hall! He was playing Rachmaninoff. There is the most unbelievable picture of Pennario taken in that year. Back to Buki. There is a song for her and that is the song our friend Guy Boleri the lounge sensation sometimes sings, "Little Girl Blue". The song is from the show "Jumbo." Guy told me it was written for a circus elephant. You can tell from the verse that starts the song. Here is Nina Simone singing the song. It is a weird performance but it is cute how she weaves "Good King Wenceslas" into the music. Hmmm. This is funny. Yesterday was the feast of Saint Wenceslas, do not ask me how I know this but I do. Today is the feast day of the great Archangels: Michael, Gabriel and Raphael. But Buki died yesterday, on the feast of Saint Wenceslas. Clearly this song was intended for her. Ah! A rare day with some PC time! Buki was the friend of Lulu, who came to the zoo when we lived on Russell Ave., and stayed 40 years. They were special animals, who brought out the best in their human friends. Ward, I remember Lulu! I remember when Lulu died. It was terrible because someone wanted me to put something in Buzz about how at the Museum of Science, they were researching something about elephants by shooting darts into the dead Lulu's hide. And I just did not find that funny because I felt so sad about Lulu. Larry, isn't that a great picture? You have featured it so beautifully in the Pennario YouTube videos. That is one of those pictures that will sell the book!